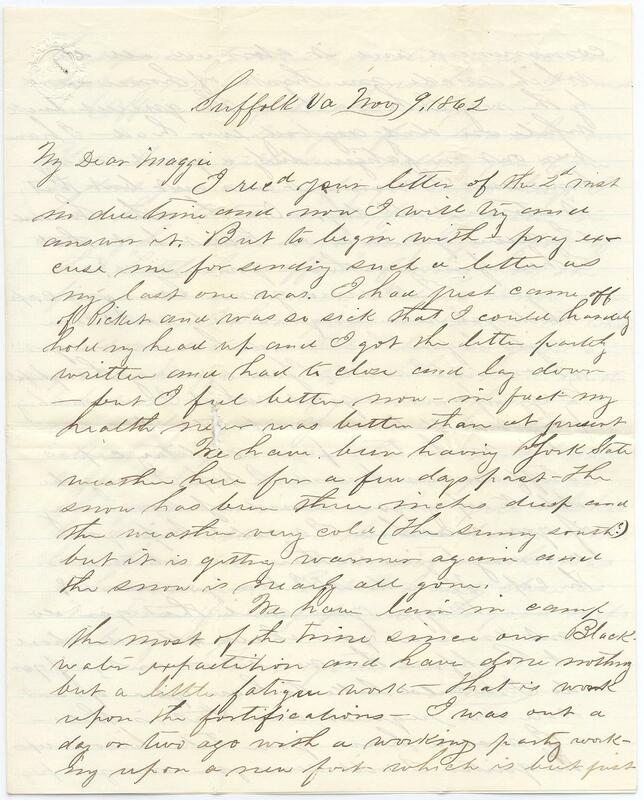 Item description: Letter, 9 November 1862, from Union soldier Stephen Tippet Andrews to his beloved, Margaret (Maggie) Little. 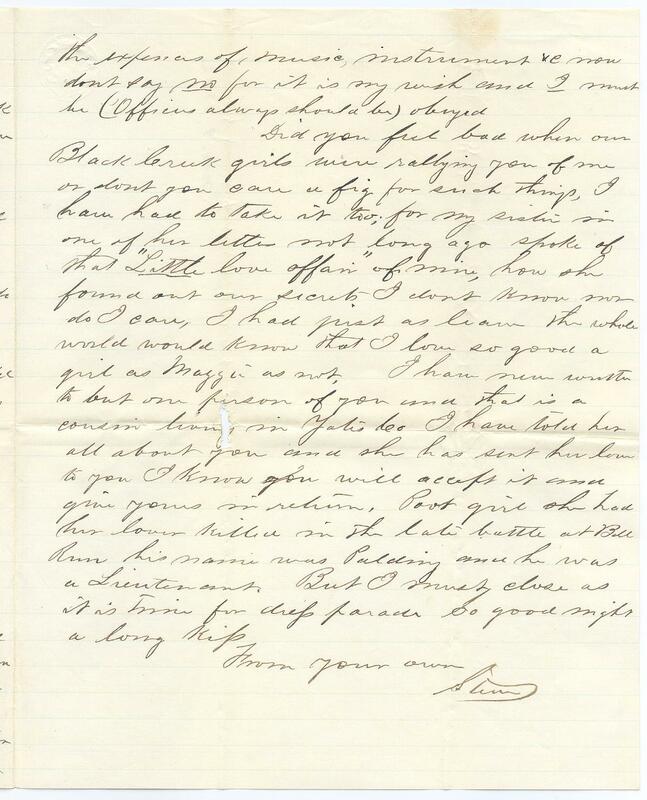 Stephen Tippet Andrews enlisted in the 85th New York Infantry Regiment on 26 August 1861. He helped organize Company F, and was mustered in as first sergeant of the company in the second half of 1861. We have been having York State weather here for a few days past – The snow has been three inches deep and weather very cold (The sunny south ?) but it is getting warmer again and the snow is nearly all gone. We have lain in camp for the most of the time since our Blackwater expadition and have done nothing but a little fatigue work – That is work upon the fortifications – I was out a day or two ago with a working party working upon a new fort which is but just commenced and it stormed all day which made me think of home – and by the way I have had the queerest (?) luck while on duty anybody ever had – I have been out on fatigue duty a great many times and I never yet was out but that it stormed all day. – On the other hand I never yet was on Picket but that I had fine weather – queer isn’t it? I received your lounging cap which you were so good as to send me the night before last and have now got it on as I write; You are very thoughtful Maggie; for it is just what I was wishing for; it will be so comfortable to wear while in the tent for a military cap is stiff and awkward, I hope I may be able to repay your kindness some day if you was here I would kiss you as many times as there are Stitches in the cap- There dont I love you sone? 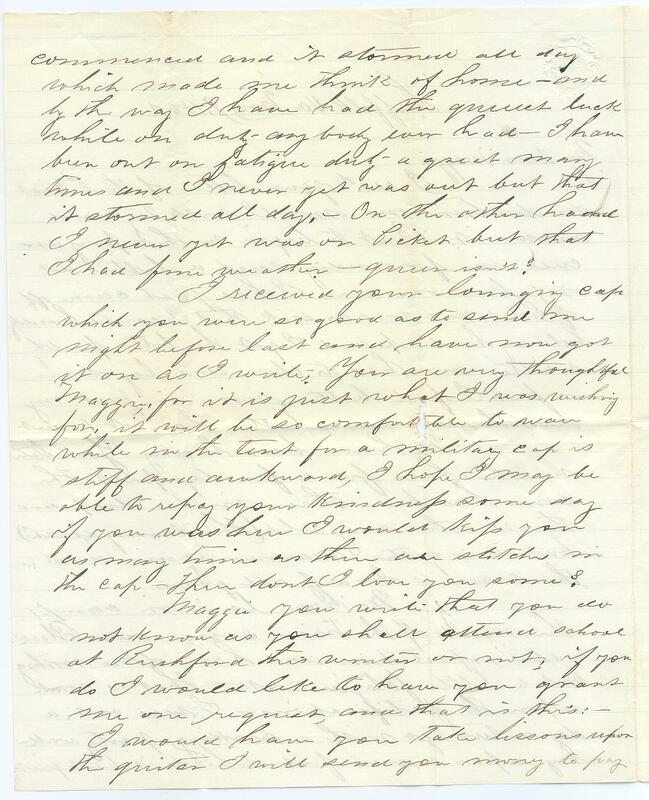 This entry was posted in Southern Historical Collection and tagged 85th New York Infantry Regiment, love letters, Margaret Little Andrews, Stephen Tippet Andrews. Bookmark the permalink.